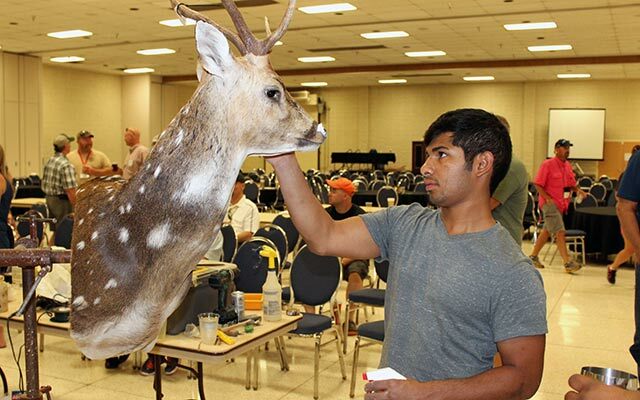 The Texas Taxidermy Association, Inc. is known throughout the country for putting on an outstanding state show, year after year. 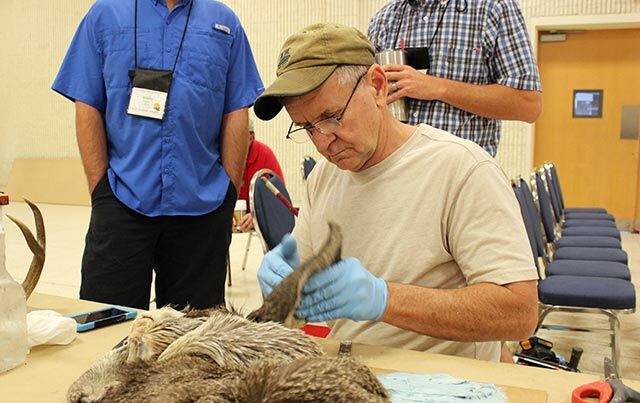 The organization and structure of the convention is as professional as they come, and the participation level puts it right up there with any regional or national taxidermy convention. Members keep coming back year after year to enjoy an entertaining, friendly and educational experience. One of the highlights of the competition is the special Texas Master’s Challenge, which has become a much-anticipated tradition. 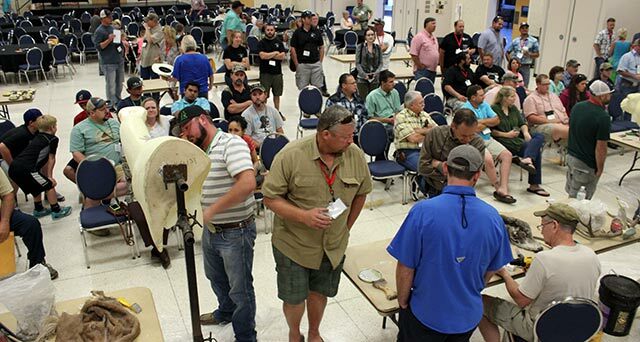 In this live head-to-head contest, competitors put together a shoulder mount in three short hours, starting with a prepped skin and a roughed-up unaltered mannikin. 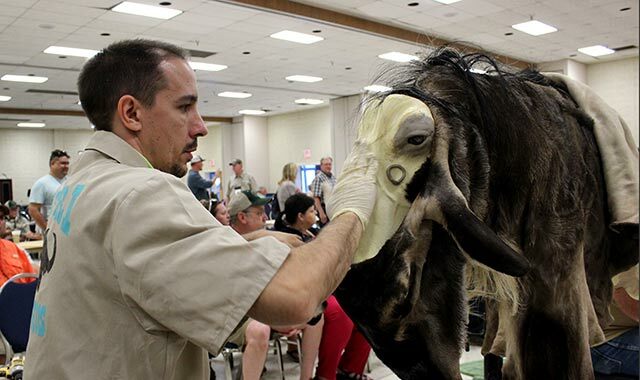 Once the competition starts, they have to alter mannikins, cut lip slots, carve out noses, mount ears, sculpt eyelids, taxi skin, tuck, groom, stitch, staple, and essentially finish the mount, all while fielding questions and comments from the dozens of spectators on hand. On the second day, participants get 15 additional minutes to fine tune their mounts and perform any finish work. For several years, this was known as the Texas Master’s Whitetail Challenge. In 2015 the board voted to change it to allow more species, and to help prevent the same people winning year after year. Only TTAI members who are eligible to compete in the Masters Division are allowed to participate in this contest. In addition to the bragging rights, there are also cash prizes for the top three winners. 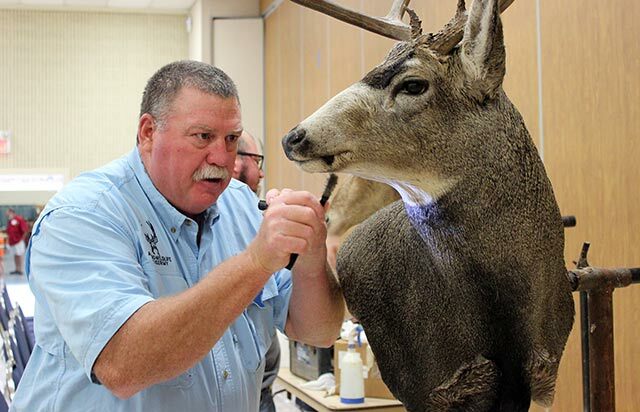 The competition is made even more compelling by the addition of a Calcutta, in which audience members are allowed to bid on their favorite taxidermist. This year the Calcutta pot reached $2,850.00, which added to the excitement in the crowd. Jake Carter of San Angelo, Texas mounted a blue wildebeest. Ben Cromeens of Houston, Texas mounted a pronghorn antelope. Mark Hernandez of Sabinal, Texas mounted an Axis deer. Jerry Huffaker of Abilene, Texas mounted a mule deer. James Newport of Pearsall, Texas mounted an Axis deer. James Poerner of Comfort, Texas mounted a mule deer. 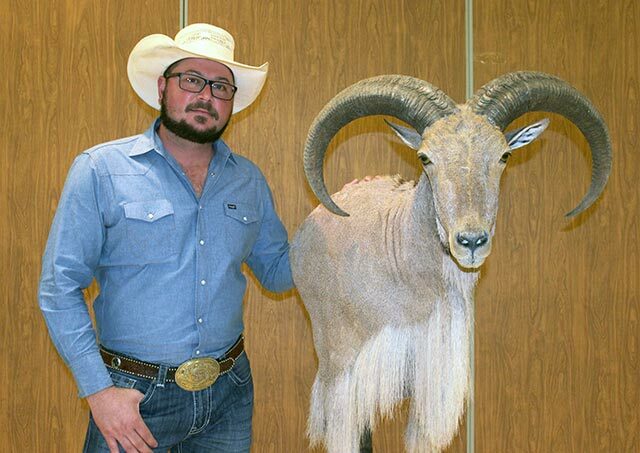 Johnny Risigner of Mount Enterprise, Texas mounted a Corsican sheep. Kailum Rooks of Pearsall, Texas mounted an Aoudad sheep. The next morning, all competitions had an additional 15 minutes to go over their mounts, perform final grooming and finishing. The team of judges did not know who mounted each of the entries. In order to give a little bit of the flavor of this fun event, I put together a video showing the Texas Master’s Challenge from start to finish, condensed down to a few minutes. Due to the overwhelming response, the TTAI will continue with the Master’s Challenge for 2015 – but it’s a Game-head challenge this year! Plan to attend – there will be a something for everyone! This will be a live game head mounting competition. Spectators can watch, ask questions, heckle and or learn something if they want to. 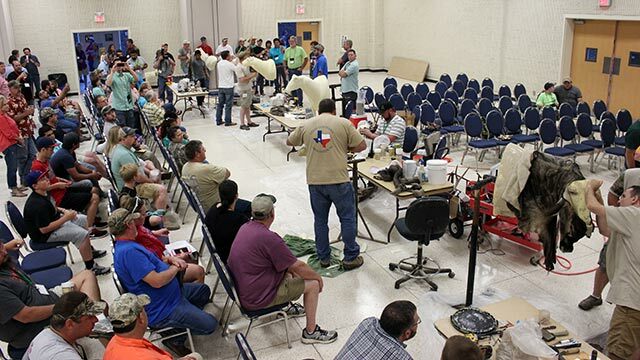 Imagine watching ten different seminars going on at the same time with some of the best Game-head taxidermist in Texas! Also bring your betting money, we will have a Calcutta at the beginning of the competition. 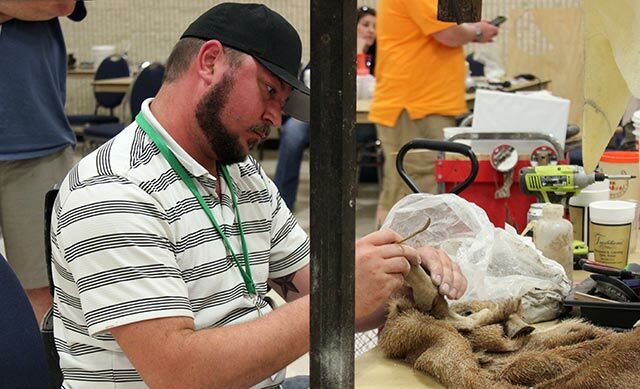 Participants will hear all the competitor’s pedigrees and can bid on your favorite Taxidermist. In the past we have had groups who bid as one! This event will be held Friday night at the convention center. If you buy the winning taxidermist, you will win all the money! Due to limited space only the first ten competitors are allowed to enter. 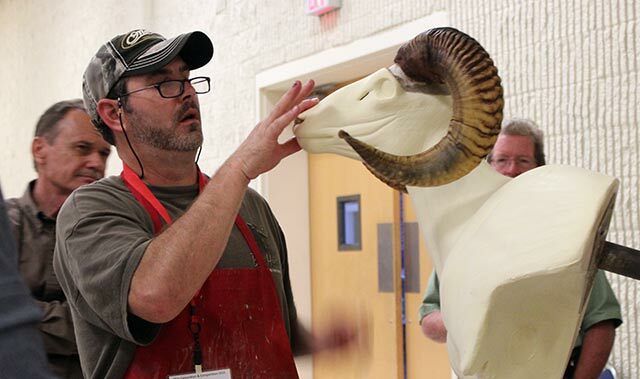 The 2015 TTAI game head and whitetail judges will judge the Master’s Challenge competition. Judge’s decision is final, there will be no protest. Entry fee is $50.00. The TTAI will add $500.00 to the pot. If there are ten entries – pay-out will be: 1st $600.00; 2nd $300.00; 3rd $100.00. The first place winner will also receive a special award from the TTAI at the Awards Banquet. 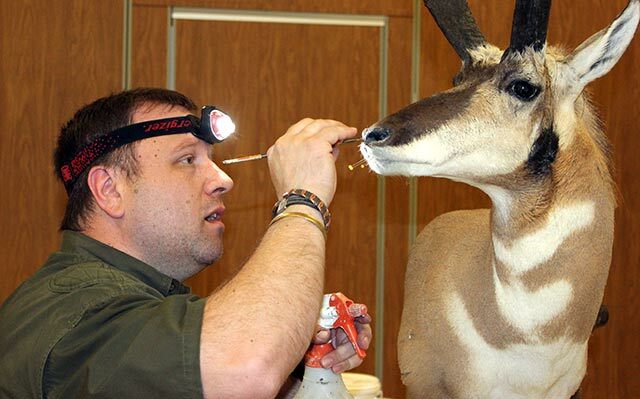 The first ten eligible taxidermists to sign up and pay $50.00 to the TTAI at the convention will be accepted. Note – no refunds issued on entry fees. If needed, the Competition Rules Committee will make decisions on any rule infractions, their decision will be final. 1. Competitors will have three hours to finish their mount. 2. Competitor may bring their choice of shoulder mount or pedestal form/manikin. 3. Any alterations to the manikin must be done during the competition. 4. Manikins can be sanded or ruffed up prior to the competition, to save on time. 5. Capes can be prepped and repaired prior to the competition. 6. Noses, lip slots and tear ducts must be done at the competition. At this time competitors can also cut, sand or add clay for detail to the manikin. ￼￼￼7. Nose work must be done during the competition. Competitors may chose to use artificial septums, cast nosepieces or replacement noses. All artificial parts must be made during the competition. Inner noses can also be rebuilt with epoxy or clay. 8. Ears can be done with Bondo or ear liners. Ears must be done at the competition. You may pull the cartilages prior to the competition. 9. Ear butts must be clay or like material and formed at the competition. 10. 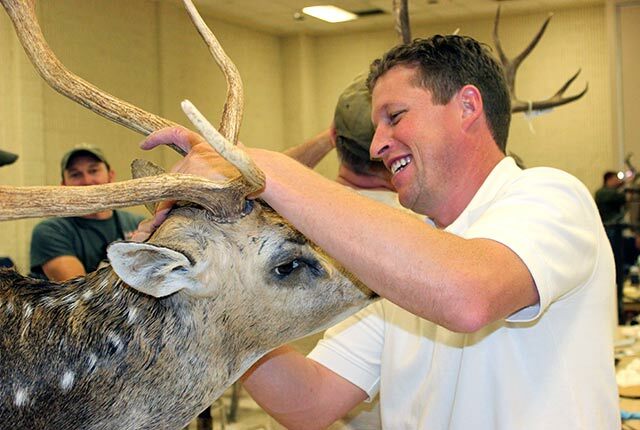 Antlers or horns may be set and screwed down prior to the competition. 11. Competitors will have 15 minutes the next morning to go over their mounts before judging. No exceptions! There will be no score sheets during the judging. Judges will not know who mounted the entries. Judge’s decision will be final! 12. Winners are announced at the Award Banquet. Click here To see other winning entries from the 2015 Texas Taxidermy Association, Inc. Convention.